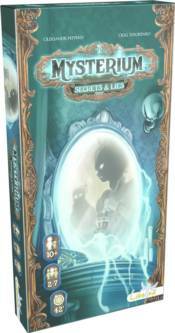 Shed new light on the strange events leading up to the ghost�s death in Secrets & Lies, the second expansion for the breakout game of 2015, Mysterium. Using their gifts, the psychics� task is to lift the veil on these troubling events, using eighteen brand new story cards to provide further context to why this ghost met such an untimely end. These new story cards replace the object cards, adding a different way to play your favorite game without extending the time limits. Additionally, you�ll find 42 additional vision cards that the ghost can use to assist the psychics as they investigate the all-new suspects, locations, and objects (six of each). Step inside, your seat at the table awaits!